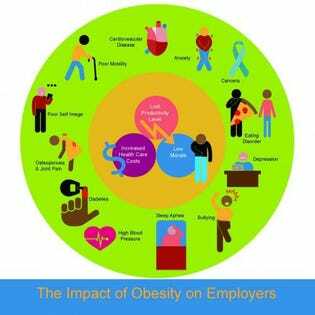 Why should employers care about obesity...as long as revenues are "fat" and costs are "lean?" Many myths still exist about the growing global obesity epidemic and, like doughnuts, have major holes. These myths, in turn, may be keeping employers from addressing what is becoming a major problem for businesses. You have to make obesity treatment actually pay off at the corporate level. I would suggest taking a company’s obese diabetic patients and giving them free food that follows the Joslin Diabetes dietary guidelines (virtually identical to the Zone Diet). Then you get an approximate 14:1 return on investment. The less metabolically compromised the employee, the lower the return on investment. The worst economic choice is to build a corporate gym as the lean employees will be the primary ones using it.